The DS4300 has been specifi cally designed to weigh premature and newborn infants. This neonatal scale can measure the weight of the tiniest babies to an accuracy of 0.1 oz. This precise neonatal scale features movement compensation technology that results in an extremely fast and accurate display. Even when the infant is moving, the DS4300 captures the actual weight. The last stable weight is stored and can be recalled at the push of the Last Weight button. This unique feature frees the nursing staff to care for the infant rather than the number on the scale display. 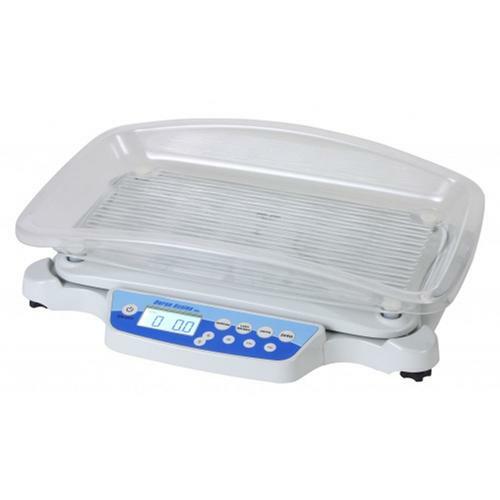 Epoxy coated steel base and clear plastic infant weighing tray. Constructed of heavy guage painted steel, the scale cart provides a convenient and safe way to move the neonatal or infant scale around a busy medical office or hospital pediatric ward. The base of the cart features high impact plastic bumpers and a low center of gravity to prevent the cart from tipping over. Moving the scale is easy thanks to the 5” diameter wheels and ergonomic push handles. Two of the easy roll casters lock to ensure that the scale cart stays in place while the scale is being used. The roomy shelves has plenty of space for medical supplies and the 3” deep drawer locks for security.